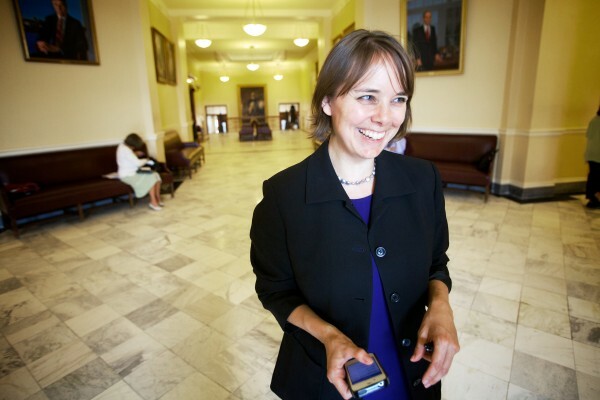 Shenna Bellows, executive director of the American Civil Liberties Union of Maine, is all smiles after the legislature voted on July 9, 2013, to override Gov. LePage's veto of LD 415, strengthening warrant requirements for acquiring cellphone location information. PORTLAND, Maine — The executive director of the American Civil Liberties Union of Maine has resigned, a member of the organization confirmed Friday. Shenna Bellows announced Thursday evening on her Facebook page that she was stepping down from her leadership role. Bellows had led the organization for eight years, according to ACLU of Maine spokeswoman Rachel Healy. The posting also included information about Bellows’ recent wedding to Brandon Baldwin. Healy said Bellows gave the organization advance notice of her departure. “Shenna has left us a stronger organization thanks to her leadership,” Healy said Friday. Karen Foster of Portland has been named interim executive director, Healy said. A search committee has been formed and a replacement for Bellows will be selected as soon as possible, Healy said. Working for the ACLU has been very rewarding for her, wrote Bellows, who lives in Manchester and grew up in Hancock. “That’s the gift that the ACLU gives to us — staff, volunteers and members alike: the chance to be part of something larger than ourselves, to be a part of history. The ACLU is at the forefront of the country’s most important battles over the issues we hold so dear, from marriage equality to reproductive rights to free speech. No other organization has contributed so much to the protection and promotion of civil rights and constitutional liberties over the last century. Bellows did not elaborate on her new adventure but sources within the Democratic party in Maine think she might run against Republican U.S. Sen. Susan Collins in 2014.